Cheap wooden display easel. The wording that generates the most hits on search engines is cheap wooden easel, so that's what we list this cheap wooden display easel as. This display easel is smooth sanded wood. For painting or display. With leg chain and rubber tips on the legs for stability. Height: 64" (Natural color only, sorry no painted black). 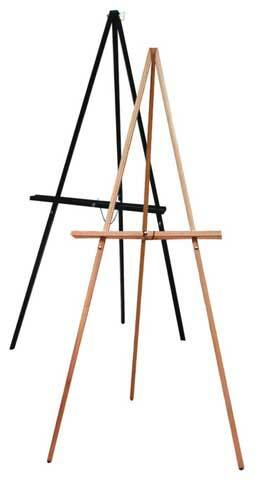 A fantastic price because most that purchase this easel need wholesale pricing.